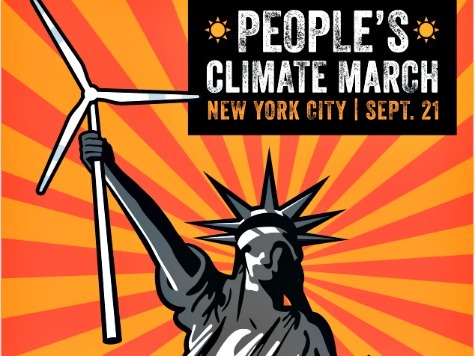 A report from PJ Media beautifully illustrates how the climate-change contingent is aligned with Communists who hope to change the American system. The report is replete with photographs of the rally, convincingly demonstrating that the Communist movement, which leftists have been portraying as ineffectual since the days of Joseph McCarthy, while consciously or subconsciously championing its principles, is rearing its head in very public ways. Our situation is dire. But before we can begin to address any of the possible solutions, it is important that we discuss the root cause of the environmental catastrophe that we are experiencing. What we are facing is a systemic problem. A conflict between two systems. First is the environmental system, which sustains life on Earth. Then there is the economic system of capitalism that is attacking the stability of our environment. Capitalism and a healthy environment cannot coexist! … They [the government] are not going to put a stop to the capitalist practices. They can only mitigate them. But we’re beyond the point of mitigation: What we need is transformation! … We must go into our workplaces, schools, churches, communities, and talk to people about what we have learned here today. … We can see that capitalism has run its course, and it has written its own death sentence.